One of the nicest things about village life is the sense of community that gets people working together, and this ethos extends to local business owners who are keen to foster links with their fellow traders. A great example of this is the new venture created by two Barnt Green shops – Warwick’s and Greens Cuisine – which offers customers the best of both businesses. 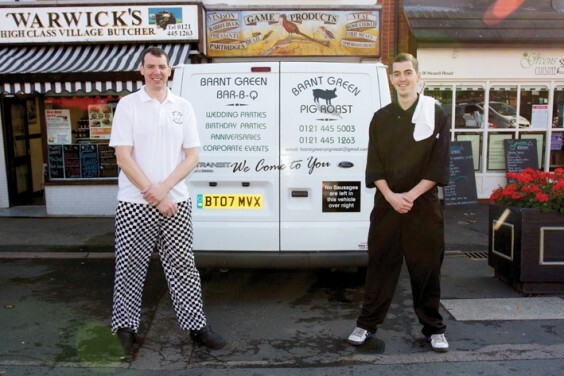 Butcher Warwick Savage and greengrocer Joe Baker launched Barnt Green Pig Roasts & BBQs last year, and it has already proved very popular with people in the local area who have been hiring the firm to cater for all sorts of occasions. “We were fully booked throughout August and September, and we’ve had to buy a second machine for the pig roasts,” says Warwick happily. He and Joe also bought a van, which has been sign written with the names of both original businesses and the new venture, and they have even taken on an events manager to co-ordinate larger parties such as weddings. Barnt Green Pig Roasts & BBQs can cater for small parties (minimum of 20 people for a BBQ, 50 for a pig roast) right through to huge gatherings for up to 300 people. Whether the event is at your own home or another venue, the team will set up their own gazebo in which to cook – and when the pig roast or BBQ is finished, any remaining food is left to be eaten later, along with a heater which can then be taken back to the shop or collected. The pig roast includes a pork bap, stuffing, gravy and apple sauce, all provided by Warwick’s, while Greens Cuisine provides the additional items such as salads, coleslaw, desserts and cakes (including wedding cakes). Prices start at £8.40 per head. Meanwhile, the events manager will organise any extra details such as a marquee, balloons, bar hire and dance floors to help the party go with a bang. Both Warwick’s and Greens Cuisine are well-placed to deliver top quality food and great customer service, since this is what they offer in their Hewell Road shops. Warwick started his business just over four years ago with the tagline “High Class Village Butchers”, and it quickly became popular for its tasty, locally-produced meat and wide range of other goods including many gluten-free items. Warwick’s also offers award-winning black pudding, Black Country faggots and 12 varieties of flavoured sausage, plus game such as venison, rabbit and pheasant, and items like stuffing and glazes for barbecued meat. Of course, there’s plenty of tempting produce for the festive season – orders are now being taken for turkey, goose, duck and chine of beef, and you can also find extras including pate, dry cured bacon “just like it used to taste”, pigs in blankets, game pie, and Warwick’s famous pork pie with cranberries. Customers can also choose to have “meat boxes” delivered to their homes, starting at just £19.99, and special Christmas hampers starting at £39.99. Greens Cuisine has expanded since Joe set up shop three years ago, and now provides busy local residents with vegetable boxes during the week, with fresh produce collected daily from Birmingham Wholesale Market. As well as sourcing the best produce at the most competitive rates, Joe delivers the boxes free of charge – meaning that you pay exactly the same price as you would in the shop itself. As well as groceries, you will also find ready-cooked meals handmade in the kitchen on site. Joe has eight years’ experience in catering, so prides himself on providing superb quality food from lasagne to lamb shanks in red wine, always using seasonal produce and creating food to suit the weather. If you visit on Saturdays, you can snap up some of the superb artisan bread that Joe has sourced from a local French baker – this is especially popular, selling out every week. There’s also a range of frozen speciality bread throughout the week, which can be popped in the oven and served as fresh as the day it was made. Coming up to his third Christmas at Greens, Joe will be offering an extensive range of seasonal produce to help you create that traditional roast dinner – from vegetable boxes with whatever you like in them to all the trimmings, sold individually or as a pack to help your day go as smoothly as possible. From pigs in blankets to cranberry sauce or Devon-cooked ham and turkey, Joe will cook anything on request as long as he can source the ingredients. Pop in to request a list of produce and trimmings available for collection or delivery on Christmas Eve or December 23. Christmas hampers are also available to order, starting from £10 – these make excellent gifts for foodies or all ages. Chocolate Lovers, Coffee Lovers, English Tea or Cheese & Biscuits are just a few ideas to tease your taste buds! From Saturday November 5, Joe and Warwick will be offering pig roasts outside the shops.